Crosscut saw, panel saw, tenon saw, coping saw. My largest hand saw. It is a crosscut saw. So called because it is designed for cutting across the grain of a piece of timber. The angle of the teeth and the size of the teeth are what makes it suitable for crosscut work. It is 26" long with 6 teeth per inch. When I look at this saw now I am reminded of how little I actually use it. Power saws rule! My first crosscut saw I owned was Identical to this one, but when I stopped using it, the blade had been sharpened down by more than two inches so that it was too thin to use any more. Very rarely you might see an old hand saw that has teeth shaped larger with slightly less rake that was used for ripping along the length of boards, a rip saw. the name is still used for circular saw blades of course. Here is my Sandvik 22" panel saw, with 9 teeth per inch. As the name suggests it was used for cutting panels, that is the panels in doors and furniture. It still cuts panels, but these days they are ply, Masonite and MDF. Also used for crosscutting smaller thicknesses of solid timber that the crosscut is a bit rough for. 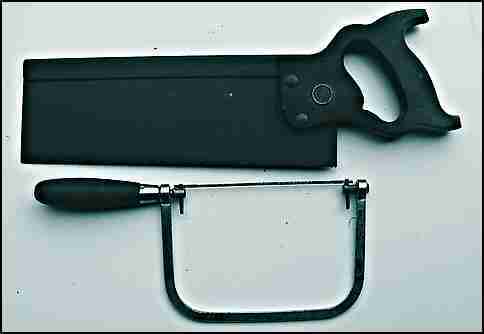 If you only have one hand saw, this is the size to go for. Or maybe a 20" or 18" for a lady. The plastic handle is fairly common and I don't see any problems with them. As you can see the one in the shot has had it's top broken off. While it is still usable many years after it fell off a roof, I don't think a timber handle would have survived. The top saw in the above pic is a tenon saw, or back saw. A back saw is a fine bladed, fine toothed saw that has a steel or brass reinforcing on the back. Used for fine joinery work. Used before machinery came in for cutting tenons in mortise and tenon joints. This one is 12" long (the blade) with 13 teeth per inch. The hole part of the joint is cut out with a mortise chisel and the other bit is the tenon. You may not want to use it for tenons any more, but they are very useful for fine work. A smaller version would be called a dovetail saw. The bottom saw in the previous pic is a coping saw. Used for cutting fine curves, and as yet not replaced by any cheap power tool. Jig saws are just too rough for coping saw work. A power fret saw would do the same work but I have never seen one used in house construction. 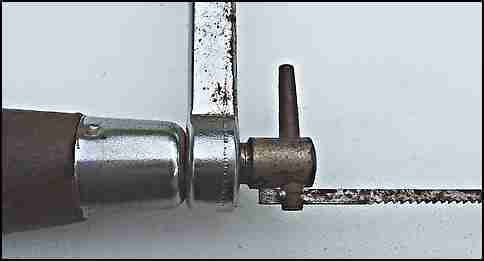 A close up shot of a coping saw. The blade is very thin and and a throw away job. Sold cheaply in packets of say ten. The lever above it, (with the one on the opposite end of the blade) allows you to rotate the blade so that you can cut full circles without any problems. Because they are so thin, this gives them them the ability to cut curves easily. Also, as they are thin, they would break easily if used for cutting on the push stroke. Put the blade in with the teeth pointing towards the handle and cut with a pulling action. Here is a page with photos of scribing a timber cornice with a coping saw. click here for an explanation of scribing. Leave hand saw and back to home page.